Ahead of my trip to Amsterdam I'd made contact with a number of Dutch patient groups and associations who had all been very interested in supporting my challenge. 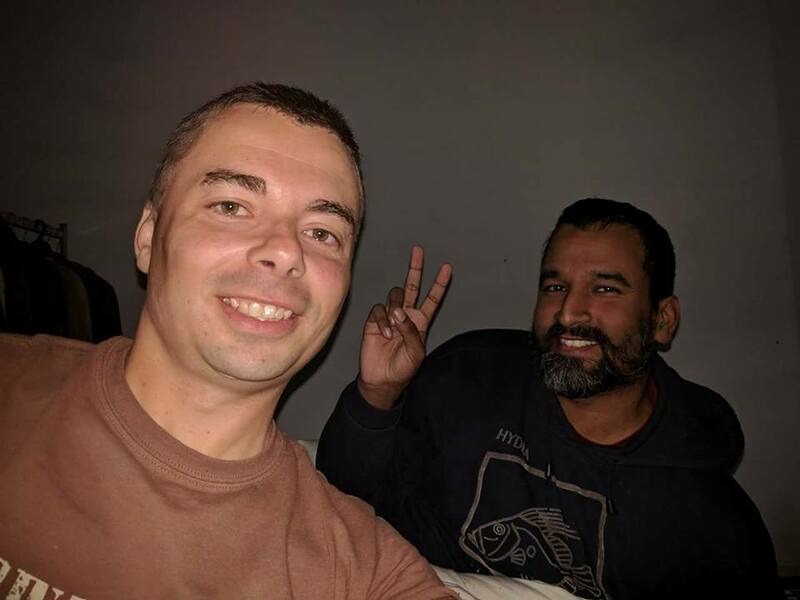 I interviewed M.E patients Anil and Frank along with campaigner and carer Rob, click here to read what they had to tell me about life with the illness in the Netherlands. 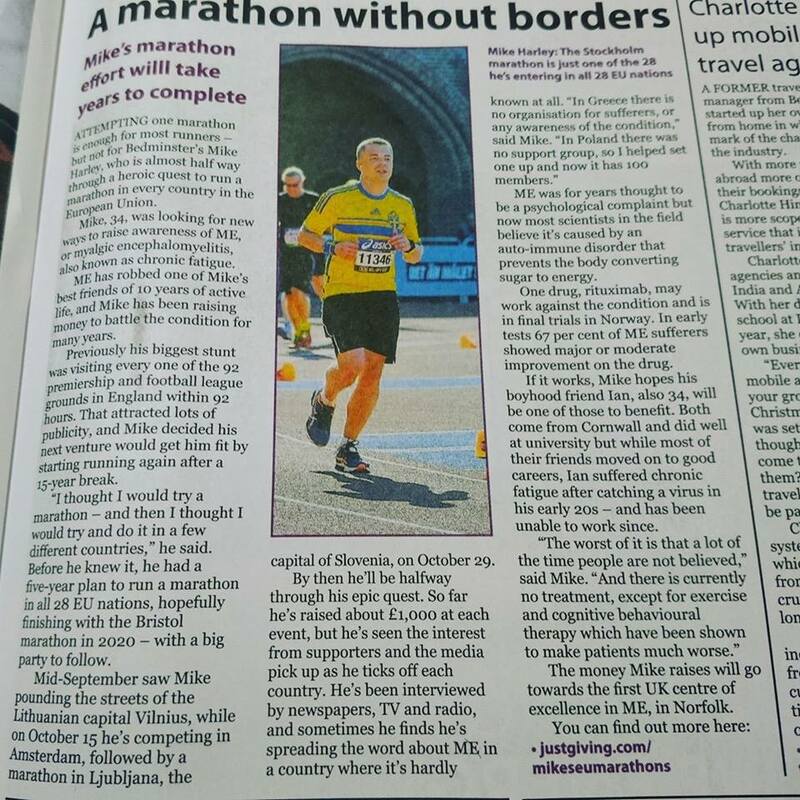 I was interviewed myself by my friend Anil (here) as well as managing to get some coverage from my local paper. I met up with Rob Wijbenga on the Saturday before the race in sunny Amsterdam and was lucky to have Celine Verweij and Dieuwertje Daams come to cheer me on at the Olympic Stadium. After the race I got back to our apartment for a shower and was whisked away by Frans in his electric car to see Anil whom I've been talking to for over 2 years. I was honoured to spend a few minutes with him, he has severe ME and I was just his second visitor of the year. It was a 9.30 start at the Olympic Stadium and after a long walk, two metro trips and a long queue to get in I took myself over to the orange starting pen (3hrs 30 - 4 hrs). It was pretty crowded but a great atmosphere with plenty of other Brits within earshot and a cloudless sky. 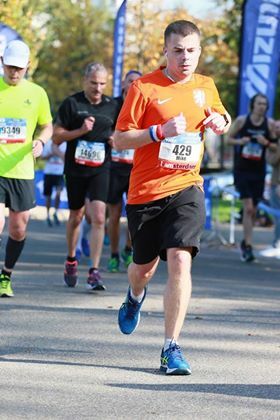 There was a minutes applause to commemorate the life of popular former Mayor of Amsterdam, Eberhard van der Laan which was stirring and then 8 minutes after the elite runners set off, our pen was able to get going. Half a lap of the magnificent stadium and the course headed out of the old stadium and out onto the streets. The route headed towards Vondelpark passing a Dutch Hurdy Gurdy and a packed crowd of supporters, one of which held the sign 'Smile, you've paid for this!' -yep that's a valid point. It was warm, maybe even 5-10C more than was typical at that time of year and I was already sweating through my cap and feeling the heat. Vondelpark was pretty but as the path narrowed and the runners bunched I found it difficult to get space to run my own pace. I was also struggling with stomach pains a little in the early stages, my pre-race breakfast of a croissant and cereal bar was in retrospect a pretty poor choice. The first water station was a disaster, it was only on one side and caught me by surprise as swathes of runners veered over shoving me into railings in order to get their half-filled paper cup of water. I tried to shake it off and got back to concentrating on holding a steady 8.30 min/mile average as the route went under the arches at the fantastic Rijksmuseum; that was really cool. Up next was a fairly dull out-and-back down Beethovenstraat and the first hour was done. 6.7 miles for that, slower than in training but understandable given the crowds and heat I thought. Without Ipod for the first half as I now usually did, I was able to soak in the music from the bands on open trucks and brass bands playing the Rocky theme which helped break the tension of chasing time. Plenty of kids to high-five, some were banging pots and pans from their apartment balconies; Amsterdam is one of those cities that embraces the event fully. I applauded every band, enthusiastic marshal and every person who shouted 'Come on Mike' got a sweaty thumbs up. Skirting around Martin Luther Park the route slalomed out of the city along the banks of the Amstel. This part was a long stretch, almost an hour in length but I enjoyed every minute of it. First up we ran past a barge with a band playing on top as it chased the runners downstream. An old gent was crooning away and having the time of his life, it was entertaining and genuinely funny. Not much in the way of water stations on this bit but plenty of stunning lowland countryside on view to distract and a slight cooling wind away from the business district and it's high rises. There was no crowd support out here but there were two adventurers performing acrobatics with water jet packs and megaphones to keep the runners amused; the quirky Dutch sense of humour at its finest. A stunning windmill on the right hand-side reminds me of the one in my profile picture as we veered left over a foot bridge and down the opposite side of the riverbank. More barges with bands playing, this time a guy was on his own playing boogie-woogie on a grand piano, so good! Some locals had taken it upon themselves to provide fluids to the runners by setting up their own water stations outside their beautiful stately homes. Halfway came and went and I'd hit 1hr 54 minutes; slightly ahead of the target time to hit my personal best. I wasn't sure I could keep the pace in the rising heat and with so little water. I was also getting some achilles and hip pains so quickly popped some ibuprofen and a HoneyPower gel. I saw Cat at 25km who handed me a bottle of pre-mixed electrolyte water, it didn't take long to down it and I continued to hit a steady pace still under my target finish time. Getting up to 18 miles and more things started to hurt. The Van Der Madeweg road was a bit dull and I went for the Ipod to try and keep things on track. The times had started to slip as the pain, heat and boredom were taking it's toll. I wasn't going to hit a PB but a sub-4hr marathon was still pretty doable. Up to the final hour and all was OK, I knew I would finish. You can't ever take that for granted especially when you see people being carried off the course in ambulances. Around 20 miles in the course heads west for a long way. Still plenty of support and funny signs; 'Look me up on Tinder' and 'Beer this way' amongst others making me chuckle. There was a definite funky smell of weed around this part with people sat outside bars with ice cold beers cheering and banging on tables. I was feeling pretty tired and had started to walk through water stations, partly to avoid getting pushed about as the runners descended but also to give me time to grab enough water and massage my quads which had started to ache a lot. Up to 23 miles and I had the last of my energy gels and occupied my mind with trying to work out a possible finish time. I had enough time in the bank to make it under 4 hours still but I knew from experience that miles 22-25 were the hardest. Around me the runners had thinned out a bit, some were walking, some hunched over railings really hurting. I saw some older runners (mid 60's) pass them with a remarkable steady rhythm, running is 90% in the mind but even so I always find that so impressive. The course went back through Vondelpark and I knew it wasn't too far to go. There were a few gentle inclines that you really notice after 3.5hrs pounding the roads but this was by far the flattest course I had done/or will do so I really couldn't complain. 4hrs was going to be tight and I didn't have much left in the tank, I had resigned myself to just missing out as we closed in on the stadium. It felt as though there were huge cheers running up the last 200m on the track, perhaps it was in my head, but shuffling down the home straight felt amazing. I got over the line and looked in the crowd for Cat and the others. Looking at the watch I had made it in 4 hrs and 1 minute. My 4th fastest of 13 so far, it was a sign of how much progress I'd made with my running recently that I felt a bit disappointed with the time. But on meeting Cat, Celine, Didi and Anil (later) afterwards that feeling disappeared and the lasting memories were of a really special weekend in the Netherlands; one that I wouldn't forget. 14C rising to 21C, sunny, no wind and cloudless skies. Much warmer than they expected and a bit of a shame on what was a really flat, PB course. Course: 7/10 - Logistically impossible to run the course through the centre, the route took in Vondelpark, countryside, canals and business districts. Stadium start and finish was fantastic. Expo: 7/10 - Decent enough sports halls with stalls, interactive events and some cool bits. Number pick up was easy. Support: 8/10 - Really good for 3/4 of the course in built up areas. Bands on trucks and barges, drummers, old guys on megaphones, people on bridges, great marshalling. Refreshments: 4/10 - Not enough water stops given the heat, cups not bottles, stations on one side of the road let to chaos/shoving. Goodie Bag: 1/10 - For 80Euros to enter, 1 tee shirt and a bottle of water was really poor. 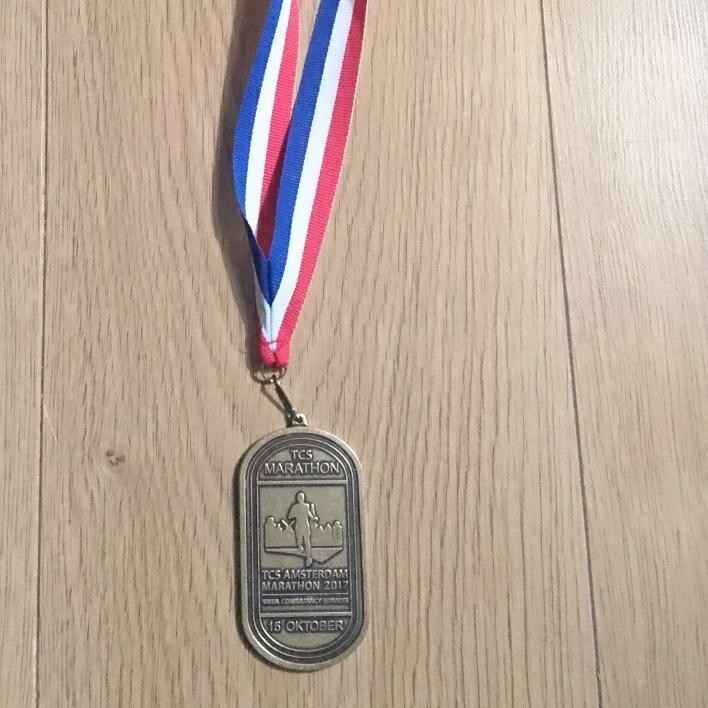 Medals & Pics: 4/10 - Medal was very budget and cheap looking sadly.